In an ongoing effort to address the need for spay and neuter services for Oakland’s free-roaming cats, Friends of Oakland Animal Services (FOAS) is pleased to announce its partnership with local Trap/Neuter/Return (TNR) volunteers, Feral Change. Feral Change is an all-volunteer organization dedicated to the humane control of Oakland’s feral and stray cats. In addition to offering support to the community for TNR services, Feral Change is one of Oakland Animal Services’ partners helping to address the unique challenges of housing, re-homing and care of surrendered feral cats. Our first joint venture is to spay and neuter 125 free-roaming cats through the trapping efforts of Feral Change. FOAS and Feral Change continue to explore ways to help address the need for low-cost/no-cost spay/neuter services of our community’s feral cats, and look forward to announcing new initiatives that will help area residents. During high kitten season in the spring and summer, it’s not unusual to discover a nest of unattended kittens or a single kitten seemingly abandoned by the mother. You want to help, right? Mama Cat may be off searching for food. She has to keep herself well fed to produce milk for the babies! It is not unusual for a mama cat to be gone several hours. She may also be in the process of moving the babies from one location to another (especially if you’ve found one alone). Does their fur look healthy, full and fluffy? OR Are they dirty? Sickly? Eyes crusty? Are they sleeping quietly? In a heap? OR Are they crying? Squalling? Are they dry? OR Are they wet/soaked? Traffic – pedestrian foot traffic? mean neighbors/kids? bicycles or cars? Unless the kittens are in immediate danger, it is best to watch to see if the mama cat will return. You should be at least 35 feet away (more is better). You may need to leave completely and come back later (4-6 hours) to check whether the kittens are still OK (dry, sleeping/quiet, appear fed, etc.) Especially if she’s feral, Mama Cat will most likely NOT return until she no longer senses human presence. Know that healthy kittens can survive several hours without food as long as they are warm. 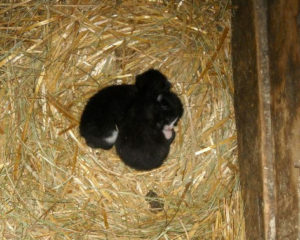 Neonatal kittens are much more at risk of hypothermia than they are of starvation. During typical ‘kitten season’ spring and summer months, waiting a longer time to see if Mama Cat will come back is usually very safe. Remove the kittens **only** if they are in immediate, grave danger OR if they appear very sickly and ill. 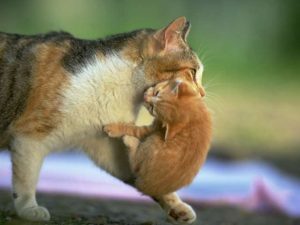 If Mama Cat returns and the area is relatively safe, leave the kittens alone with Mama Cat until they are weaned (5-6 weeks). You can monitor the environment and offer a shelter and regular food to Mama Cat … but keep the food and shelter at a distance from each other. Mom will find the food but will not accept your shelter if the food is nearby, because she will not want to attract other cats – or any other predators — to food located near her nest. If at all possible, its best to leave kittens with the Mama Cat for at least four weeks. 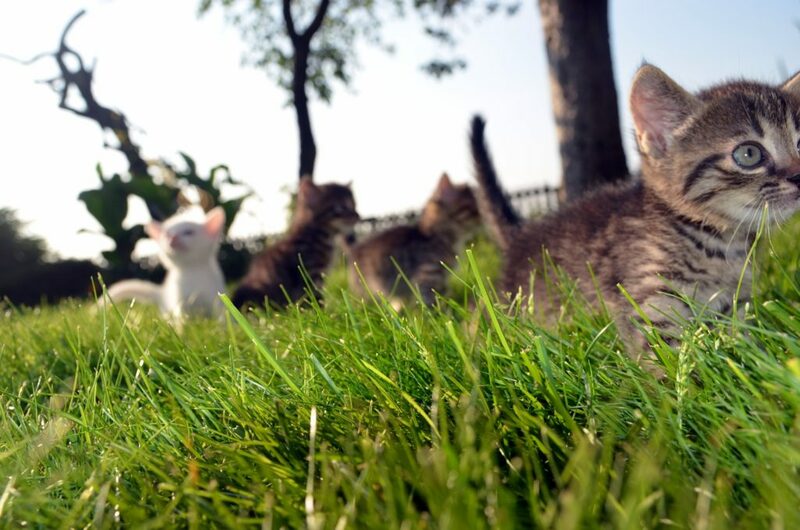 Five to six weeks is the optimal age to take the kittens from the mother for socialization and adoption placement, and any time after eight weeks for Trap-Neuter-Return (spay/neuter, vaccination, eartip, and return to their colony). NOTE: Female cats can become pregnant with a new litter even while they are still nursing, so don’t forget to get the mother cat spayed or you will have more kittens soon! For information or advice about trapping Mama Cats – and about local feral cat help and TNR programs, contact Fix our Ferals and/or ICRA. The Mama Cat offers her kittens the absolute best chance for survival, so WAIT and WATCH as long as you can. The best food for kittens is their mother’s milk. She will provide them not only with properly balanced nutrition but also much-needed antibodies and immune system support! 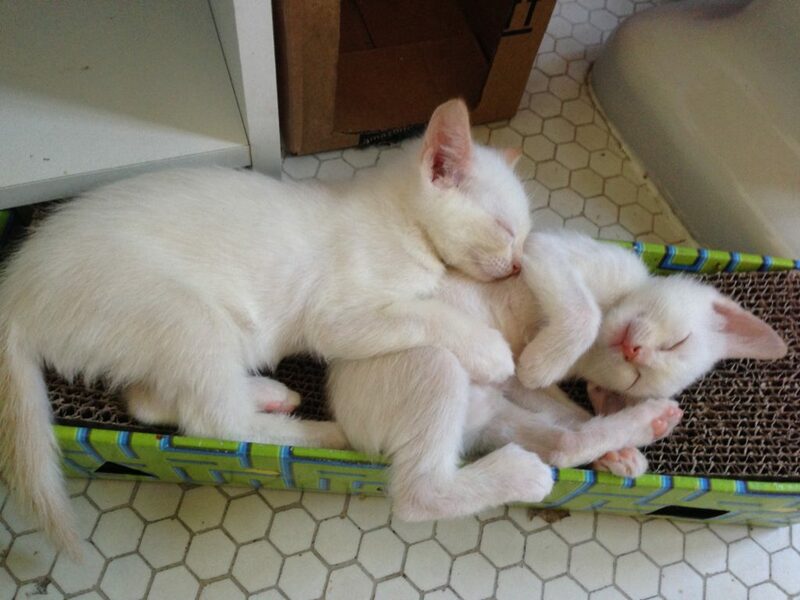 If you decide to raise abandoned kittens, check with Pet Food Express. They may be able to provide free starter kits that contain a small amount of specially formulated kitten milk, a bottle, and other emergency, essential supplies for raising a tiny kitten. Meet Ruthie, a gentle soul with a loving personality. She came to the shelter in April as a stray and has been waiting patiently for her family ever since. Ruthie is in a foster home but needs a permanent place to call her own. You can help by downloading her flyer and helping us spread the word about this lovely girl. Ruthie is a sponsored dog, which means a generous donor has covered her adoption fee. You can donate here if you would like to sponsor animals like Ruthie. All adult cats (over one year old) such as Raya. Dogs who have been at the shelter for more than four weeks, like Triscuit. Oakland residents adopting dogs over four months old must purchase a dog license at the time of adoption.